28m², 2 bedrooms, well equipped, well appointed, comfortable, gas or electric heating, terrace with garden furniture. 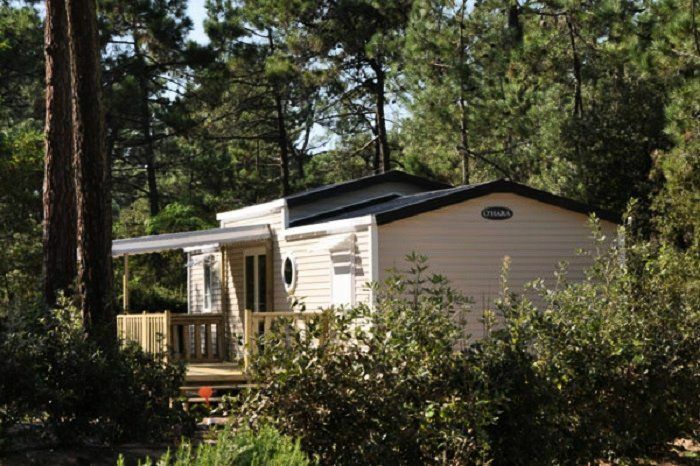 Located in St Hilaire de Riez in Vendée and only 1.2km from the beach, Camping Domaine des Pins **** welcomes you in a natural and wooded setting for a successful family holiday. Guests can enjoy the outdoor swimming pool with children's pool, the indoor swimming pool and the bubble bath, as well as the children's playground, petanque and ping-pong. A children's club for 4-10 years is also available (11/07 to 26/08). For your comfort, the campsite offers a multitude of services: restaurant *, bar * with television, snack *, takeaway *, grocery *, laundry *, wifi *. Many sporting activities are possible nearby: mini-golf and course in the trees (1km), horsemanship (4km), water sports (5km) or golf (10km). Do not miss the island of Noirmoutier, the Sables d'Olonne and its port and the salt marshes! Pay-shuttle buses back and forth to the beach from the campsite in July and August. Mobile home 3 rooms 5 adults with a child of 28m ² composed of a corner cooks equipped, a stay with sofa bed for 1 person, a room with a double bed (140x190), a second room with 2 single beds (80x190) and a bunk bed (not suitable for children under 10 years) or extra, a shower room, toilet and a terrace. Note: For some accommodations, 3rd bed in the children's room is replaced by the sofa in the living room. accommodation capacity: 5 adults + 1 child including baby. Adult from 14 years. The kitchen is equipped with cooking fires, a microwave, refrigerator and cooking utensils and crockery. The terrace is equipped with garden furniture. The equipment also includes a gas or electric heating. A11: Paris, Le Mans, Angers, Nantes direction Bordeaux-Saint Philbert de Grand Lieu then Machecoul, Challans, Saint Jean de Monts. At the roundabout located at a place called Le Pissot, follow Saint Jean de Monts. At 2 km, at the roundabout, turn right onto Saint Jean de Monts center.